The Diener School has a strong therapeutic team consisting of a Speech-Language Pathologist, Occupational Therapist, Adaptive Physical Education instructor and a Behavioral consultant. All of our therapists work in close collaboration with the entire teaching and administrative staff in order to hone in on individualized goals and supports which allow for students to have optimal access to our curriculum. Both Speech and Occupational therapies are provided to our students in a push in therapeutic model within the classroom setting. Our therapists may work in whole or small group settings with the homeroom teaching team always present. This push in setting allows for the therapists to not only conduct the appropriate therapeutic lessons but also sets the tone and allows for therapeutic techniques to be modeled for the teaching team, Our teachers can, in turn, appropriately utilize therapeutic strategies during those “teachable moments” that happen during the course of the week when the therapists are not present. Our occupational therapists closely observe both classroom structures as well as students’ habits. In turn, they will create individualized sensory diets, purposeful gross and fine motor breaks and other therapeutic interventions to ensure that each student is given the proper tools and opportunities to optimally access our curriculum. The connection between movement and learning is a key component to The Diener School philosophy. Diener students are able to sustain attention when instruction is coupled with purposeful and frequent movement. A full-time adaptive PE teacher assists in implementing this important cornerstone of our program while also teaching our students sports skills and the importance of good sportsmanship. Our speech-language pathologist plays an important role in our holistic educational environment as we carefully and purposefully balance the importance of academic and social-emotional growth. Pragmatic language discussions, facilitated play, modeling of expected language, appropriate verbal volleys, and Social Thinking curriculum experiences are just some of the important strategies our speech-language pathologist employs in the push in a classroom setting. Our goal is to begin to bridge the gap in social thinking skills to a more developmentally appropriate level. Our Behavior consultants work with the entire Diener team in order to explore positive reinforcements, understand the function of some behaviors, helps our students process difficult situations. Whether it is the use of token boards, Diener Dollars, contracts, visual schedules and rules, these strategies are all plugged in to allow our students to feel great about themselves and proud of their accomplishments. The consistency between whole group, homeroom, small academic settings and special classes are important in making sure our students understand expectations for optimal outcomes. 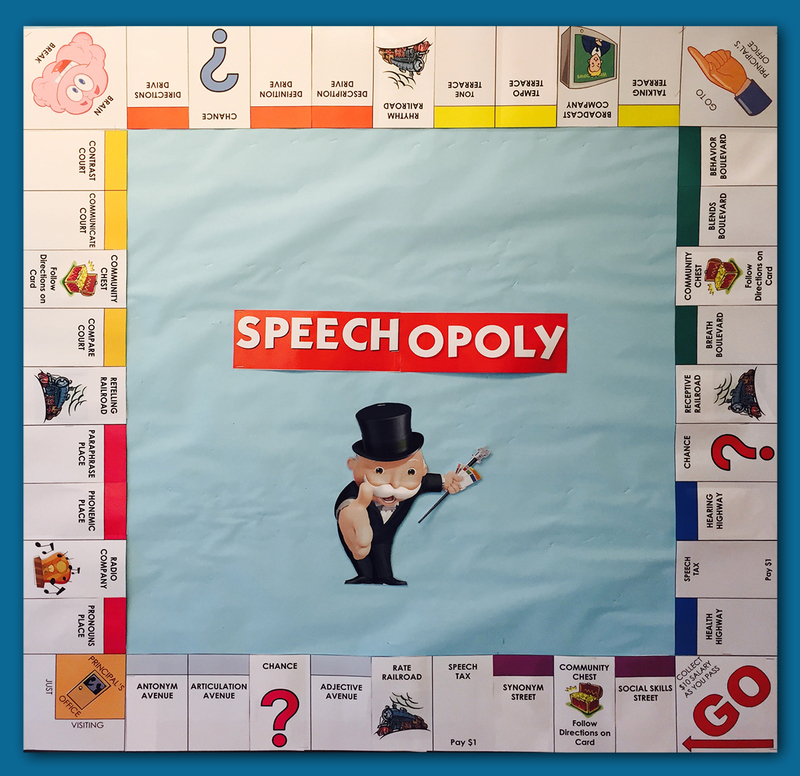 Speechopoly – A tool we use at the Diener School to help students with speech therapy.